This could very well be an attempt on Omega’s behalf to assert its technological strenght. For how else do you explain their comin up with a very expensive limited edition watch collection that has only 18 pieces. 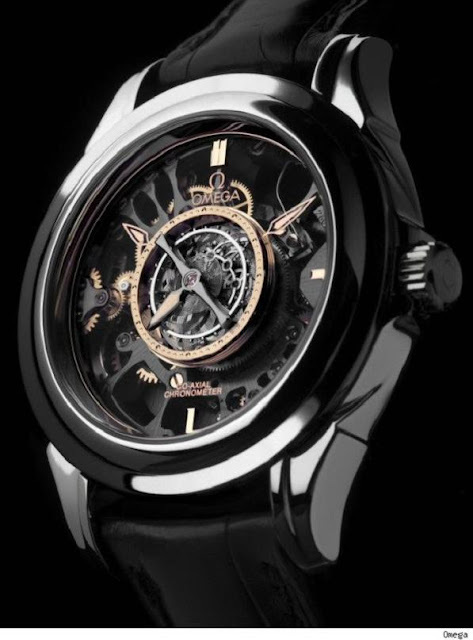 We are referring to the Central Tourbillon Co-Axial Platinum watch. This one is clearly a complex modern timepiece which is here to flaunt its every inch. An insider tells us that Omega really wanted to create a centrally mounted tourbillon. In this case, we can see it place right in the middle of the watch dial. Might we add, this is something that has never been attempted before though there are watches like the new Thomas Prescher Mysterious Automatic Double Axis Tourbillon who claim to be so but aren’t tecnically in that category yet. Omega has lent its new watch sapphire dics in place of the watch hands. This adds a real mysterious touch. And keeping to the brand’s reputation, each chronometer is certified for accuracy. The platinum cases are in the De Ville style and come with complementing Alligator straps. It might not be the most attractive watch in the market right not but it surely leaves a strong impression.